13 Treasures. Digital image. Goodreads. N.p., n.d. Web. 12 Nov. 2014. 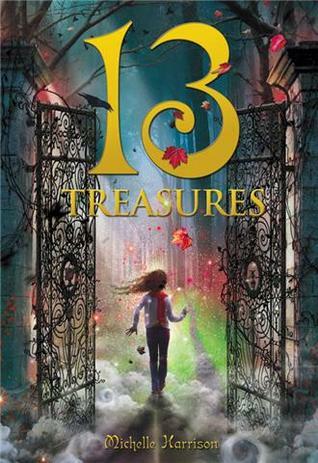 I read this book 13 treasures, by Michelle Harrison. This has a interesting setting, and this is a book that has magic realism in it. This book is about a girl named Tanya who can see magical creatures, and one of the creatures fairies, is ruining Tanya’s life by bullying her, destroying things and making it Tanya’s fault, or making people think that. In fact, other people can’t see fairies. Everything changes when she goes to her grandma’s house, she also gets to the closest to death as she would be able to. I think the important part of this book is the theme, which I think is friendship can solve almost any problem. It is because Tanya’s problem seems impossible to solve, but when she is the closest to to death, her friends saves her. I think this story has a very interesting and a meaningful theme, but I think this story is too simple. I think this is a partly good book because it has a really meaningful theme, which I think is good. I like how the author tells us how friendship can overcome almost everything. I think this is a good theme because this tells how much friendship is important, and I also agree that it is important. I think another point that this book is good is that how the setting is magic realism. I think that most teenagers don’t prefer fantasy-fantasy world, nothing realistic, but I also think that most teenagers also won’t prefer a completely real story. In my opinion, I think magic realism is the best because it is realistic, but more interesting events happen in a magic realism book than a non-fiction book. I think people should read this book because this book makes you feel happy about their friendship, but a little scared looking at what they are facing, which can also mean death, if they lose. I think including death makes people want to read to the end of the book, and I personally think you should. To conclude, I think this is a really interesting book that girls should read, because it isn’t too magical, nor too realistic, and also the book also tells you how much friendship is important in our lives. In this field studies, I learned that if I be a risk-taker, I can do a lot of things, and it might not be that bad. I learned this by jumping after canyoning, and also when I performed the skit with my activity group. I also learned that I can sort of adjust to a lot of places than I thought. I learned that if can be a little more confident and practice more with my team for performances. I got out of my comfort zone by interacting with people I’m usually not with. I also got out of my comfort zone by not staying at home, or school, or places that I’m usually in. During the performance I got out of my comfort zone by performing with other people and also performing skits, which I don’t perform a lot.